Creative because they sell. And make you laugh. 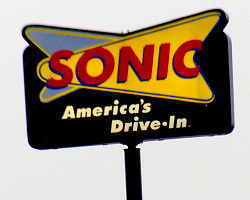 With a playful image and drive-in format, Sonic Restaurants have popped up everywhere throughout the Sunbelt (3,400 U.S. locations plus one in Mexico). These eateries feature absolutely nothing a dietician would recommend, but a lot of things people instinctively love. The onion rings, fried “Ched’R Poppers" and tater tots are delicious. Sonic's mega-calorie “toaster” sandwiches are probably the best burgers or chicken sandwiches in the get-it-and-go food world. And the fatty, fruity drinks are to die for (or die from). But what I enjoy most about Sonic are its commercials. These are clearly not spots based on the most creative concept or inventive cinematography. In fact, the creative approach is about as ordinary as you can get. A Sonic spot is comprised of cute but very human dialog between two people inside their car or minivan parked at a Sonic Drive In. Sonic's "two guys" spots star actors T. J. Jagodowski and Peter Grosz. The "two girlfriends" are Katie Rich and Sayjal Joshi. And the husband and wife are Molly Erdman and Brian Huskey. The visual perspective is always straight ahead, as if the camera is located where the rear-view mirror would ordinarily be placed. And except for the punchy graphics and announcer copy at the end, the spots are entirely comprised of actors' dialog. Antagonistic interplay between a husband and wife or between two friends is the standard angle. There is humor both in the reality of the car eating situations and in the actors’ gently overblown delivery. Who can’t relate to a friend who just doesn’t get the joke? Or a husband that gets just a little carried away with the meal experience? And there is always a good chance that food will be thrown or dropped by one of the characters as a point is made. The spots also do their jobs as retail marketing tools always featuring a special price promotion. Their natural improv-style humor is consistent with a brand that obviously is comfortable with itself. Viewers who miss Drew Carey’s original show or Seinfeld would most likely find much to like in these 30-second mini sitcoms. They are campy, cute, shot-on-video spots that work because we can all see a little of ourselves in those two seats.